A long time ago, in a cave just outside of a village known as Ofa, a soon-to-be mother dragon named Gladys tended to her egg. Her husband, Thadeus, came home and checked on his wife and their soon-to-be offspring. As the expected parents looked down into the nest, the egg started to move ever so slightly. “It’s starting, Gladys!” Thadeus exclaimed. This was their first child, which made it all the more exciting for the couple. They watched as cracks started to appear near the top of the egg and it wasn’t long before a tiny set of claws poked their way through the opening. “Come on! Come on out, baby!” Gladys said to the egg, encouragingly. Another set of claws appeared as the youngster worked its way out of its shell. This was followed by the nose and soon the whole head was out. The dragon couple watched breathlessly as more of their newborn appeared. After a short time of clawing and biting, the dragon child emerged fully from its egg. The mother and father caressed the newborn with their noses. “It’s a boy!” Gladys exclaimed. “Everything seems normal,” said Thaddy, as he was commonly known. Everything was normal. At least until the newborn dragon sneezed and a small stream of fire shot out of its tiny body. Last year I took part in NaNoWriMo (National Novel Writing Month) but didn’t finish the story that I started. There were many reasons for me not reaching the 50,000 word target; a big part of it is deadlines. We don’t get along, deadlines and I. Especially when it comes to creative projects. Another thing was that I was basing my story on an already existing one by a different author. Not only that, but it was an extremely long one. The story was Varney the Vampire and if you’ve ever read the entire thing, congratulate yourself on finishing what it possibly the longest book ever written. Reading the whole 3,000 page story and trying to write 50,000 words in a month proved to be a little too much for me. The daily quota of writing 1,600 words was okay at first, but after about a week of that I found myself struggling to create content. I had no idea where the story was going and I need a clearer sense of direction when I’m writing. As a result of this lack of direction, I was changing story elements constantly. I changed character names 3 or 4 times and it became difficult to keep track of all the changes I was making. I also wasn’t satisfied with the story that I was coming up with. Most of it was filler; stuff that I was throwing in just to try and meet the daily quote. That’s not my kind of writing at all. Not only in terms of the structure, but the style. This story really didn’t feel like me. I can write 1,600 words a day but it’s not going to make a lot of sense. The mandate of the NaNoWriMo project is just to write, it doesn’t have to be a finished piece at the end but that’s not the way I write. Once I write something, I generally don’t make a lot of changes to it later. I write sequentially and when I’m writing part of a story, it’s nearly fully finished soon after I start it. That doesn’t really work for the type of writing required to complete a 50,000 word draft in a month. There was also the fact that it needed to be an original story, not one that I had already worked on. I have dozens of story ideas, many of which I’ve already started on and some that I’m almost finished. I’d much rather try and finish a project that I started than try to come up with another new idea that ultimately goes nowhere. It has literally gone nowhere. When December 1st came around, I stopped working on the story and haven’t touched it since. Someday I plan on re-writing and trying to salvage it, but for the time being I have my eye on other writing projects. Maybe I’ll finish it someday, maybe I won’t. For these reasons, I’ll be participating in NaNoWriMo again this year… sort of. I’m going to do it on my terms. First: it’s going to be a story that I started brainstorming a couple of years ago and actually did start writing. Not much was completed, basically half a page or so already existed. Second: I started re-writing it a couple of weeks ago. I didn’t wait until November 1st to start. Right now I’m about 3 chapters and 800 words into it. Third: I’m not going to set any word total or daily quota. Whatever I end up with is whatever I end up with. Basically, I’m starting it off as a short story. If it gets to be longer, it’ll become a novella. If I do get up to the 50,000 word range then it will become a novel. Fourth: I’m not giving myself until the end of November. If I’m still writing it into the new year, so be it. It’ll get done when it gets done. I really think this is the way to go for me. Do it on my own terms and at my own pace. If I go a few days or weeks without writing anything, that’s fine by me. I’m busy with work and other things in my life, I really don’t have a lot of time to spare and I’m not going to go out of my way to make time for this. Whenever I feel like writing, I’ll write. I have no expectations right now and I’ll wait to see where it takes me. In my next post I’ll present the first chapter as a sneak preview. This is going to be much more my style of writing and I’m looking forward to finishing it, whenever that may be. 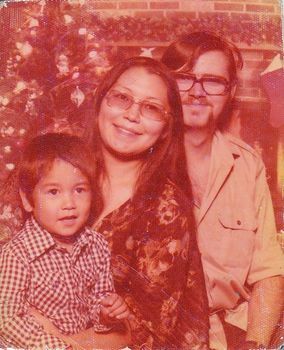 It’s a small picture, about 2” x 2 1/2.” In this photo is my mother, my father and me. I don’t know how old I was, but I’m pretty sure I was five years old or younger. The reason I can pinpoint it to this time period is that my brother is five years younger than I am, and he’s not in this picture so it was probably taken before he was born. Also not pictured is my sister, who is the youngest of us and obviously could not be in the picture. Our father, sadly, passed on a few years ago. For this reason, it was an even nicer surprise to find this picture. Little did I know that, before long, I was in for an even bigger surprise. It’s a bigger, 8” x 10” black and white version of it. Is that a surprise? Not really. The surprise is where this picture was found: in a thrift store. 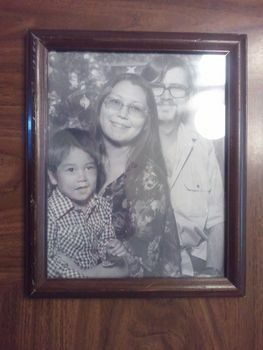 Somehow, someway, our family picture found its way into a second-hand store in our home town and it just so happened that my sister saw it there. The store owner, obviously not knowing who we are, was trying to sell the frame with the picture in it. Apparently they were going to take the picture out and sell the frame but luckily my sister saw it before this happened. She asked if she could have it, since it’s her family in the picture, so it was given to her. The question now becomes: how in the world did one of our family pictures end up in a thrift store? Especially one of our earliest pictures with 2/5 of our family not even born yet? It’s a mystery, I can’t imagine how that happened. An even bigger mystery is that they were found so close in time. I found the color photo on March 29, 2013 and the framed picture was shown to me on April 11, 2013. That’s 14 days apart. Regardless of the strange circumstances, I’m glad we found both copies of this picture and can preserve that part of our family’s history.